Are all nibs made out of stainless steel? Can I clean the pen? The Bulkfiller mechanism allows for a great flow to be rapidly sucked into the pen and be pushed out again. This causes a lot of internal turbulence which thoroughly cleans the pen for an ink swap. Can I customize my pen? Does this come with extra charges? To fully personalize your Bulkfiller, Conid offers a service to engrave the clip of your pen. This service comes with a small extra charge. Furthermore, our webshop offers a broad selection of nibs which are fully customizable in terms of material, grinding and tipping size. It is possible to order these nibs separately, without purchasing a Bulkfiller. You can fill in your preferences in the fields available in the order form. Any additional requests can be left in the comment section on the order page. Can I stay updated with the latest Conid developments? You can subscribe to our newsletter to stay tuned about our newest collections, limited editions and expositions. You can find the subscription section in the right corner at the bottom of our homepage. Conid is also very active on social media. You can find us on Facebook and Instagram or under #conidpen. For more visual information about our latest developments, please make sure to visit our YouTube page. Do you have a disassembly guide available? We have set up a detailed how-to guide with video guidance in our how-to section. Does a titanium nib have a greater flexibility than a stainless steel nib? It is the most flew nib. The following order indicates our material from most flexible to least flexible: Titanium – Gold – Stainless steel. Does Conid provide any discount or sale? As we charge our manufacturing cost, we do not run any discounts for our Bulkfillers. Does the piston have to be lubricated? For thorough maintenance, it is indeed advised to lubricate the piston every once in a while with silicone grease. An indicator on whether your pen needs to be greased is when you experience some resistance moving the piston. A good regular alternative for silicon grease is to use Vaseline instead. How does my pen get its matte silky finish? Is this a coating? This finish is inherent to the material itself. There is no (rubber) coating of any sort involved in this process. How does the cap of a Minimalistica stay on? The cap is equipped with an O-ring inside which makes the cap stay on with friction-fit. Capping and uncapping should be done with a pushing and rotating motion. How soon will the pen be sent my way? In normal conditions, shipment takes 4 to 6 weeks after we received a payment receipt. This time does not include the actual carrier time to your destination. We are aware that this is a very long wait in times of “next day deliveries” and giants like Amazon. However, please consider the fact that each Conid Bulkfiller is assembled upon request and completely tuned towards the future owner’s needs and desires. Of course, whenever we are able to deliver on a faster base, we surely will. I already have the tool for the disassembly of the Kingsize. Is it compatible? You can use your Kingsize tool also for the Regular, Minimalistica, Giraffe and Slimline. The Kingsize tool features on one side the "filler removal tool" and on the other side the "filling knob removal tool". On all other versions you only need the "filler removal tool". The Kingsize tool is actually standard for all Bulkfiller versions. My Ebonite Bulkfiller loses its shine over time, how can I solve this? It is true that the colour of the Ebonite material can change when it is exposed to continuous light, therefore we recommend our customers to put the pen in its box or pen case after use. Like all types of hard rubber, Ebonite is also subject to a gradual oxidation, which is inherent to the material. This has nothing to do with the general quality of the material, since we exclusively use Ebonite of supreme quality, manufactured by SEM in Hamburg, Germany. If your pen experiences any kind of deficiency or discoloration of the housing, please contact us via the contact form. What do I use my Conid tool for? The Conid tool is necessary to completely disassemble the pen, more specifically to undo the closure nut from the barrel. This is a nice asset if you would like to properly maintain and thoroughly clean your Bulkfiller. Cleaning can also be done by flushing the pen with water. The tooling is not required at all to perform this flushing. What is the CAISO system and does it come in other collections than the Kingsize? The main goal of the CAISO (Cap Actuated Ink Shut Off) is to make the use of the Kingsize Bulkfiller a bit easier. Some people did not like to unscrew the hand nut to be able to use the ink in the main ink reservoir. Therefore we developed the CAISO system which opens the main ink chamber when uncapping. The CAISO system is only available for the Kingsize model. What is the difference between the “sleek” and the “streamline” models? The main difference between the Streamline and the Sleek model is due to the small indentation near the cap of the pens. Our Streamline model has a completely smooth surface when the cap is unscrewed. When capped, a small step appears between the cap and the barrel. Our Sleek model, however, has a completely smooth surface with the cap screwed on. When the cap is unscrewed, a small step appears between the barrel and the section. What is the name of the clear plastic used in the pen barrels and caps? The clear parts of our first generation of pens were all made of Polycarbonate. This was a choice made based upon the improved mechanical properties of the material, with excellent impact strength compared to Plexiglass. However, for a while now, we are using Plexiglass instead, simply because of the material’s machinability and the ease to get an improved mirror smooth polish. After all, the conducted test proved that Plexiglass parts were equally undestroyable as their Polycarbonate predecessors. Where can I buy a Conidpen? You can purchase our Conid bulkfillers at our webshop. We have no dealer network except for some special editions, such as the Fontoplumo Monarch, AVDA Phi Collection and lastly our AntwerPPen, which is exclusively sold in Antwerp pen shops. Where can I find visual content about the Conidpen? 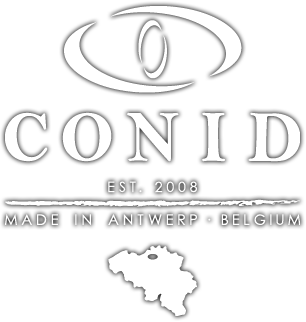 Please have a look at these page where People talk about Conid! You can find a selection of videos demonstrating 'how to maintain your Bulkfiller' on our How-to page. For more instructions and updates, please visit our YouTube-channel. You can also visit our Instagram-page. And of course our social media channels like Instagram and Facebook. Which parcel delivery service is responsible for shipping my pen? Regarding the shipment, we are proud to announce that shipments will be done with DHL Express. Our goal is to have a state-of-the-art carrier with a superb and reliable tracking system, as we want to make sure your Bulkfiller arrives safely and in time. Why is my nib leaking? If you notice that your nib is leaking, this may be due to the following issues: first of all, the O-ring behind the nib housing might be missing. Secondly, this can be due to the housing that is not screwed in completely or the nib unit itself is not incorrectly pushed into the housing.